These books are designed to return American Christian homes to their historic role of building the foundations of American Christian character. They answer the question what do I need to know to teach the next generation about the Hand of God in American history. Emphasizing the important role of the Chain of Christianity® in revealing the power of Christ in bringing forth liberty for the individual in both civil and religious spheres. The blessing of liberty will not be perpetuated unless the principles of that liberty are taught in each generation. Read “Mastering the Leading Ideas of the ‘Red Books‘” for more information. For over forty years, the foreward-thinking vision of Verna Hall and Rosalie Slater to document the Christian history of the U.S. Constitution has inspired American Christians to reclaim our nation for Christ His Story. The “Red Books,” have inspired the church, the family, and the individual, in the unique, providential purpose of our nation, so that each generation can be taught anew the value and stewardship of American liberty and its Gospel purpose. The “Red Books” were purposely designed using the symbolic colors of gold (Christian character) and red (the blood of Christ) with the embossed eagle logo. The first three volumes are the classic “Red Books.” The fourth and sixth are similarly designed with blue vellum to represent the faith and courage of the American patriot. The fifth, similar also in design, is black and was published to commemorate Ronald Reagan’s “Year of the Bible” in 1983. The Christian History of the Constitution of the United States: Christian Self-Government, Vol I (CHOC I): The primary source documentation of the Biblical principles that formed the U.S. Constitution. First published in 1960. 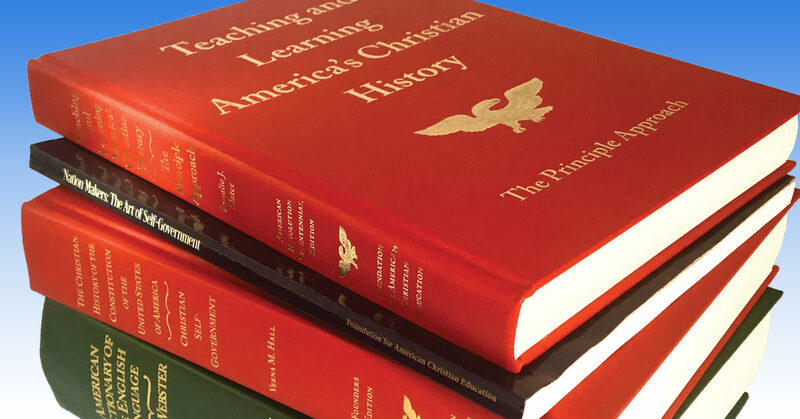 Teaching and Learning America’s Christian History: the Principle Approach (T&L): The teacher and parent’s guide to CHOC I. First published in 1964. The Christian History of the Constitution of the United States: Christian Self-government with Union (CHOC II): Further primary source documentation of the Biblical principles that formed the U.S. Constitution and the union of the Republic. First published in 1962. The Christian History of the American Revolution: Consider and Ponder (C&P): The primary source documentation of the War for Independence. First published in 1976. The Bible and the Constitution: The primary source documentation of the influence of the Bible upon American liberty. First published in 1983. George Washington: The Character and Influence of One Man: Washington as his contemporaries describe him—primary sources. First published in 1999. The Christian History Library, an 11-volume collection of educational classics are available as a digital download from Logos Bible Software. These electronic books are loaded with cross references and links to the King James Bible, which is included in the collection. Order directly from LOGOS.